Opener Graham Clark hit a maiden List A century but Durham Jets let a winning opportunity slip away at Worcestershire Rapids in a dramatic turnaround at New Road. The Jets appeared to be cruising towards their 271 target after an opening stand of 122 in 24 overs between Clark and Keaton Jennings. But former Durham all-rounder John Hastings and veteran Daryl Mitchell claimed three wickets apiece to turn the game on its head after tight spells from spinners Moeen Ali and Brett D’Oliveira helped to apply the pressure. The Jets eventually closed on 255-9 and went down by 15 runs. Clark and Jennings were relatively untroubled although the latter had a let off on 19 off Hastings as keeper Ben Cox spilled a chance when he dived across Tom Kohler-Cadmore. Clark went to his half century off 66 balls and the 100 came up in the 20th over before Moeen Ali made a much needed breakthrough for the home side. Jennings (47) went for a reverse sweep and an alert Kohler-Cadmore at slip held onto the chance. Mitchell then bowled Michael Richardson (14) and Brett D’Oliveira held onto a return catch from Cameron Steel. Hastings came back into the attack and his second delivery brought about the downfall of Paul Collingwood, who perished to a low return catch. Then three wickets tumbled in three overs - the third of them being the prized wicket of Clark for 114 off 128 balls with two sixes and seven fours. He holed out to long on off Mitchell who also disposed of Ryan Pringle while in between Hastings sent back Paul Coughlin. Hastings claimed a third scalp in his final over when Stuart Poynter was caught behind and he finished with 3-50 from his 10 overs. The Rapids innings centred around a first half century of the campaign from D’Oliveira after they had been put into bat. Openers Ali (34) - in the last match of his current spell with the Rapids before rejoining England - and Kohler-Cadmore (48) put on 58 in 11 overs. The other substantial partnership saw D’Oliveira and Cox (32) add 64 in 11 overs for the fifth wicket. 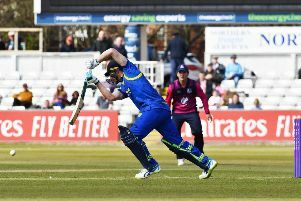 Durham head coach Jon Lewis said: “I don’t think it ever looked quite like a stroll (with the bat). It was a good partnership (122 for first wicket Graham Clark and Keaton Jennings). It never quite got the run rate down, it held the run rate steady. “As a fielding team, you know if it is still staying steady and you get a new guy at the crease, you can try and impose yourself which, to be fair to Worcestershire, they did very well. “They squeezed the new batsmen very well and we stopped dictating the terms.